From juliska's Graham Collection - Subtly intricate detailing has a luxurious and tailored effect that sparkles with feminine romanticism but is also handsome enough for the hand of Mr. Darcy. Soft drinks, juices and wines are beautiful in this stemless. 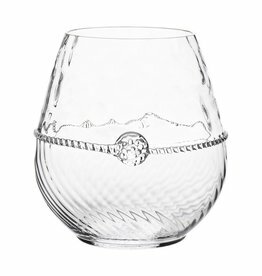 From Juliska's Graham Collection - Stunning optic glass catches the sun as you enjoy a crisp white wine or chilled cocktail on a summer afternoon. This modern essential adds sparkle to your everyday dining.